God knew Abraham would never be able to fulfil his life calling while he was still with his people. The first step to his calling and success in life was going to the right context. God had to move Abraham away from the environment that hindered his growth and faith. One of the most important decisions in life is to decide what environment you will live in. Once you have decided that, the most important decision to make is whether you will stay there. King David is a great example of this. He had to be a shepherd. This was God's place for him. But he outgrew his place and had to be moved. It was God's will for him to be the leader of a band of misfits, but only for a period of time. Once he learned what he had to and impacted that place, he moved on. It is a good thing he wasn't like so many of us that feel like we cannot move anywhere because of a previous decision we made. It is important to find your place. But equally important is the discernment to know how long you have to stay. How do you know what the right environment looks like? The following factors might give you a guideline for assessing your current environment. Too many people spend a great number of hours working in a job that does not move them towards their purpose. The general motivation is money. Mostly, these people do not want to admit that they are driven by money, but their ultimate motivation is to fulfil their needs. To live in your purpose will require intentionality and sacrifice. Many people do not live in their purpose because they have not found their people. Are you with the right people? You will never be able to accomplish your purpose in isolation. 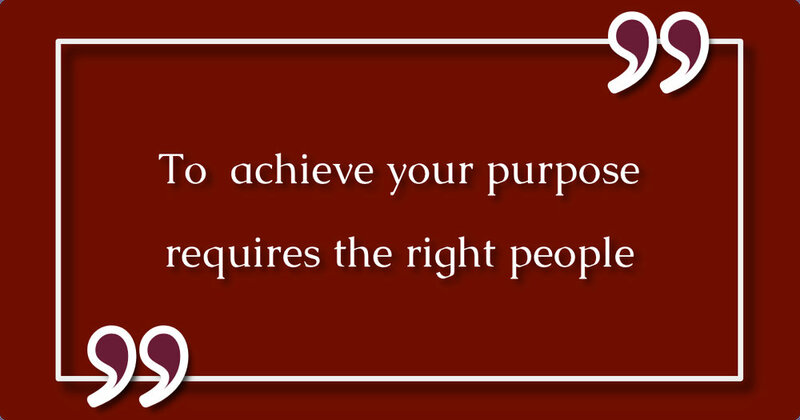 Achieving your purpose requires the right people. When you dissect your soul, you will find the sum total of various people and experiences inside yourself. Therefore, your future you will be determined by the people you are spending time with now. Consequently, it is crucial that you surround yourself with the right people. If you cannot tick these boxes, you need to either change yourself or change the people you spend your time with. The right people will help you to move forward in your life. You will be able to design a process that will move you forward. One of the sure ways to know whether you are in the right environment is to look at the processes that help you move forward. When you have clear goals and know the direction of your life, you will be able to develop systems that will create constant progress in your life. This consistency will help you achieve goals easier and quicker. When your priorities are clear and your systems in place, you will be able to determine what tomorrow looks like and have a sense of security in your life. Many people who are in the wrong environment will let their circumstances determine their priorities. When you are living on purpose, you will spend your time and energy on your purpose. Ask yourself, what are the 5 most important things I need to do every day in order to accomplish my dream? If you can not achieve these 5 things every day, you probably need to start assessing whether you are in the right environment. The right processes will determine progress. I heard John Maxwell say "if you are at the top of your class, you are in the wrong class". Whenever you are in an environment where you can grow and develop, you are in the right place. The moment you stop growing, you need to move. Personal development is a huge part of reaching your design in life. When God told Abraham to move, Abraham had no idea how many opportunities for failure and development awaited him. But he grew and developed because he was willing to move with God. This kind of thinking will help you to determine whether or not you are in the right place for your dreams to come to life. I usually advise cross-culture couples to consider living in a third culture. When these married couples live in the home country of one of them, the other would always be out of place and have to adapt to the lifestyle of the spouse. Often-times, the one living in the home country would not be able to fully understand how much their spouse has to adapt and sacrifice. This could become a tension in the marriage. Similarly, some people are in companies, cities and even countries that are not the right fit for their particular dream. When I moved to Europe over 15 years ago, I was asked why I am doing it. My answer was simple. Even at that young age, I realised my environment at that point was holding me back from living out my full potential. I had to change. I moved to a place where I could find my own identity and not live out someone else's expectations of me. Your environment determines a lot of your successes in life. For some people, they might feel like they are running away looking for a better life somewhere else. This feeling of guilt might be the very reason they refuse to consider a change. My advice is simple. If you are in the wrong place and cannot bear fruit, you need to assess whether YOU need to change or whether you need to RUN! Newer PostWhat do your mirrors say?